Chief of Defense Staff General Sarath Fonseka observes the army commandos in action at a display during Sri Lanka Army's 60th Anniversary exhibition in Colombo. What Next for Sri Lanka's 2.5 Million Tamils? To many Sri Lankans, Lieut. General Sarath Fonseka is a bit of a hero. Now the equivalent of the U.S. military's Chairman of the Joint Chiefs of Staff, Fonseka was the former army commander who helped strategize and lead the campaign that put a decisive end to the quarter-century-long separatist war of the Tamil Tigers. The intensity of the onslaught raised criticism around the world, including a 68-page State Department report to the U.S. Congress that took to task the conduct of both government forces and the Tigers. Now, what appears to be an attempt by the Department of Homeland Security (DHS) to interview Fonseka about the war has raised angry protests from the highest official ranks in Sri Lanka. According to Fonseka and other Sri Lankan officials, the DHS contacted the general on Oct. 28 during his trip to the U.S. to visit his daughters, who live in Oklahoma. Fonseka, who holds a U.S. green card permanent-residency certificate, was asked to show up for an interview on Nov. 4. According to Sri Lankan Foreign Minister Rohitha Bogollagama, Fonseka had been told by the DHS official that the objective of the interview was to "use him as a source against Defense Secretary Gottabaya Rajapaksa." Apart from being a co-author of the successful campaign against the Tigers, Gottabaya Rajapaksa is also the brother of Sri Lanka's President Mahinda Rajapaksa. Responding to previous international criticism, the Sri Lankan government declared that it would not subject any of its military commanders or civilian officials who led the war to any kind of international investigation or war-crimes tribunal. The apparent request from American officials led to a similar dismissal. In the U.S., the DHS's office of Immigration and Custom Enforcement (ICE), which reportedly made the Fonseka request, refused to confirm or deny the allegation. ICE spokesman Brandon Alvarez-Montgomery said: "If there was an investigation, there's nothing we can provide. Especially in cases that are very sensitive under human-rights violations, until that person or group were fully investigated [we] would never comment." Foreign Minister Bogollagama said he had made his government's concerns clear to the U.S. Ambassador to Sri Lanka Patricia Butenis. "The U.S. authorities should not exert procedures on [Fonseka]," Bogollagama said. "The interview should not take place." The Sri Lankan government believes that despite Fonseka's status as a green-card holder, the U.S. does not have any jurisdiction over him at this point because he entered the country on a Sri Lankan passport. "General Fonseka is a citizen of Sri Lanka and he holds a diplomatic passport from Sri Lanka," said Bogollagama. 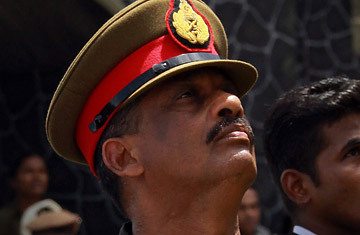 The minister said that Fonseka could not divulge privileged information he knew of the war and its conduct without approval from his superiors and the Sri Lankan government. Defense Secretary Rajapaksa  who also happens to be a U.S. citizen  was interviewed for about an hour on arrival by immigration officials when he was in New York City as part of Sri Lanka's delegation to the U.N. General Assembly sessions in October. "It happened and I was there," said Bogollagama. "We took all the necessary actions that were required." The report of the DHS interview request comes at a curious time in Sri Lankan politics. Fonseka has been the subject of speculation that he may run against President Rajapaksa in the next election. Some political observers claim that the Rajapaksa brothers are trying to sideline the general, an allegation that the Defense Secretary has denied. "This is nothing but a despicable plot being hatched at the expense of the entire country," Defense Secretary Rajapaksa told a weekend newspaper amid reports of a growing gulf between Fonseka and the government. But on Oct. 26, Fonseka seemed to have veered away from a hard-line stance he shared with the Rajapaksas. At a Buddhist temple in Washington, he spoke of the "need to resettle persons who are in camps and provide security to them." That appears to be a softening of his previous position that the peace-and-order climate in the areas reconquered by the military should not be undermined by speedy resettlement. Sri Lanka has an estimated 186,000 internally displaced people, refugees from the war with the Tigers. He warned that there might still be thousands of Tigers among them and that they needed to be weeded out. He said nothing about his alleged presidential ambitions, only that "the people who really know the victory are those who went to battle."